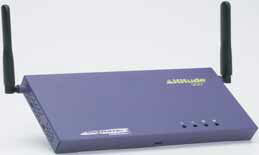 The Extreme Networks Altitude 300-2i has been discontinued. No direct replacement is available. The Altitude 300-2i is the industry's most versatile solution for enterprise-class wireless local area networks (WLANs). Antenna options and a dual-radio design that maximizes capacity combine to deliver a flexible and fast solution ready to meet any wireless networking challenge. The Altitude 300-2i wireless port is ready for future expansion and plenum-rated for safe installation in ceilings and easily blend in with any d�cor using optional case covers.